May, 2011 - This "Half Penny" overprinted and vertically bisected Revenue stamp has been a mystery of mine for about 35 years! What is known about it: 1) 6 pence stamp itself is real and 2) the Revenue overprint is real. Back in the 1880's there was NO NEED for a 1/2 penny Revenue stamp, as rates were either 1p, 3p, 6p, 1sh or higher. There was, however, a need for 1/2p postage stamps, and there were other 1/2p locally overprinted postage stamps made at that time (while they were waiting on shipments from England). That they would have used 6p revenue stamps instead of postage is doubtful (although in theory possible). I have done some research, and there is NO MENTION of this particular stamp anywhere, except for a reference to a German Philatelic magazine (Deutsche Philatelisten Zeitung) from around 1883 or 1884 (and unfortunately that particular issue of the magazine was NOT available at the APS library when I was researching this). The article supposedly refers to some fake issues like this being created. I find it amazing that during the past 35 years that I have been collecting St. Vincent stamps & postal history that I have NOT heard or seen anything about this stamp (and really not for 130 years as I have not seen any references to this other than the German magazine from the 1880's)! There must be someone out there that has the other half of this stamp! If you have any further information that can substantiate whether the Half Penny overprint and the bisect perforations are real or fake, please contact me! Summer, 2009 - The St. Vincent Postal Corporation (successor to the previous government-operated St. Vincent Postal Services) announced that it will be implementing a new "hub & spoke" system for handling the mails on the island. As a result, about 1/2 of all village post offices are scheduled to be be closed by the end of September, 2009. This will be a true loss to us St. Vincent postal history collectors. I am trying to obtain some of the "last day of use" postmarks from those post offices that are scheduled to be closed: Fancy, Owia, Overland, O'Briens Valley, Byrea, Park Hill, South Rivers, New Grounds, Greggs, Lauders, Mt. Grennan, Peruvian Vale, Calder, Prospect, Enhams, Arnos Vale, Belmont, Richland Park, Sion Hill, Lodge Village, Lowmans Leeward, Campden Park, Clare Valley, Rillan Hill, Penniston, Buccament, Coulls Hill (ie: Cumberland), Rose Hall, Rose Bank, Petit Bordel, Paget Farm (Bequia Island) and Ashton (Union Island). 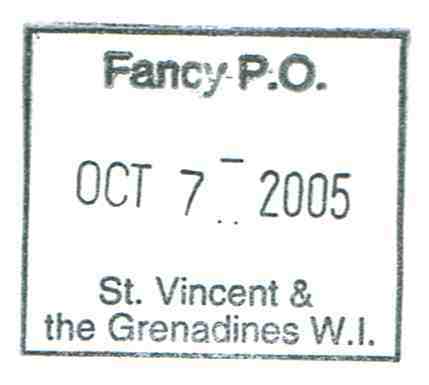 The preceding information was provided by the St. Vincent Postal Corp.
November 4, 2008 - Another provisional stamp from the skeleton map series has surfaced (thanks again to Fareeda Kajim-Defreitas). For many years, 10¢ & 20¢ stamps were needed for local postage use (and yes, there is a quite a demand for local postage stamps - the most recent statistics from the Universal Postal Union state that in 1999, over 1,400,000 domestic letters were posted!). 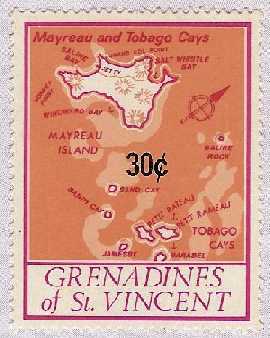 The postage rates have of course increased, and are now 30¢ for domestic St. Vincent mail (which also includes the Grenadines of St. Vincent). This particular stamp was used (but unfortunately not postmarked) around Dec. 27, 2007 and early January 2008 (reports state that this stamp was issued around November 2007). Most copies of this stamp were apparently used by the St. Vincent "Central Water & Sewage Authority" for use in mailing monthly statements). This stamp also exists with the "30¢" overprint in the lower left-hand corner of the map design. July, 2007 - While the earliest stamps of <?xml:namespace prefix = st1 ns = "urn:schemas-microsoft-com:office:smarttags" />St. Vincent were produced on unwatermarked paper, starting in 1871 with Scott #13 (1 penny black), watermarked paper with a star was introduced. In the Scott catalog, this is referred to as Watermark #5, while Gibbons refers to it as Watermark #2, and the Whitman Watermark reference catalog refers to it as #465. The star watermark is also found on stamps of Antigua, Barbados, Grenada, Natal, Queensland, St. Lucia and Turks Island. The star is placed on the sheet such that if properly printed on standard stamps of the time, that it would appear in the middle of the stamp. Every now and then though, people would say that they have a watermark error or variety, such as several straight lines and parts of the word POSTAGE in double-lined capitals. This comes from having the original sheets of watermarked paper cut up and sent through the press sideways. The full sheet has the stars surrounded in the margins by the word POSTAGE and parallel lines. 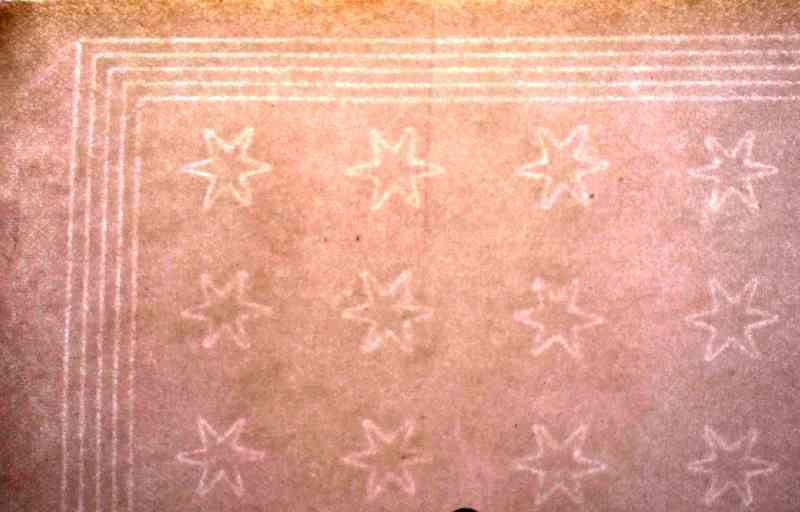 While varieties of the watermark are interesting to collect, I recently obtained a piece of unprinted paper showing the margin lines and several stars. June, 2007 - At the St. Vincent Philatelic Services there are several "skeleton" stamps available of the map type. There were designed to be overprinted with an actual value as needed for provisional uses. Some were overprinted with 10¢ & 20¢ values for local postage uses on St. Vincent. 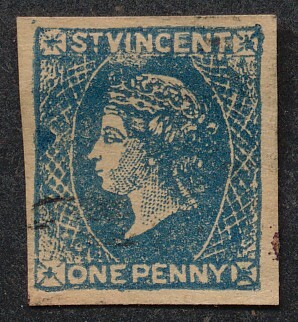 Remainders are to be withdrawn by the St. Vincent Postal Corporation; it is unknown when these were issued nor how many. Few are available to collectors (since there were for actual local postage use). The example shown here was provided to me courtesy of Fareeda Kajim. Similar stamps were last used in the 1980's. May 21-26, 2007 - About 20 members of the British Caribbean Philatelic Study Group descended on St. Vincent for the annual BCPSG meeting & exhibition which held on the island of St. Vincent this year. We all had a great time and had a chance to see various village post offices and were able to obtain postmarks, visit the philatelic bureau and had a tour of the main post office. Much new information was gathered (it's so much easier when you are "on-site"!) and several projects will start up as a result, with the help of some of the local collectors (thank you Fareeda Kajim & Ernst de Freitas!). More details will be published as they are written up. I will write some articles for the BCPSG Journal, and hopefully also for Global Stamp News and the Stamping Around newsletter of the Mid-Cities Stamp Club (www.freewebs.com/mid-citiesstampclub). April 2007 - It appears that new self-adhesive registration labels are in use in St. Vincent. At least in Kingstown anyway. Receiving a registered item here in the USA usually means that the postal clerks will scan the item at the counter, making it easier to track electronically than a manual ledger book as in the past. Whether or not the US Postal Service shares the scanned information with St. Vincent I do not know. The "VC" at the end of the code appears to stand for St. Vincent (just as I've seen DE at the end of items from Germany). These labels have at least 2 parts (maybe 3) which would be retained by the original sender and possibly the origin post office. November 13, 2006 - It is a "chicken or egg" kind of thing: which came first? 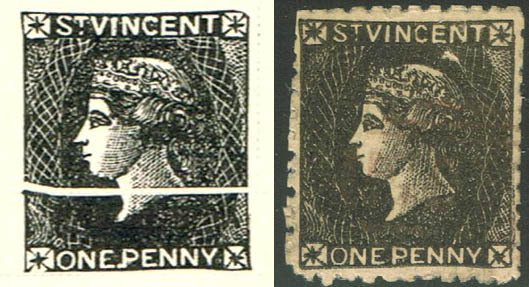 On the left is an illustration of a St. Vincent 1 penny black stamp as seen in a Scott Stamp Album page from 1938. On the right is a scan of a 1 penny black forgery (which I obtained one day ago). So, did the album (and catalog) manufacturers use the forgery as an illustration? Or did the forgers use the album illustration as the basis of their forgery? Current albums tend to use photographs of actual stamps rather than crudely drawn illustrations that were meant to represent the actual stamps. This can get to be confusing to a collector. If they have a forgery and look at their (older) album, it matches up exactly (just look at the design elements such as the queen's facial expression, the crooked borders, the poorly drawn corner ornaments, etc). So they are inclined to think that they have the real stamp, when in fact it is a forgery! This is the case not just for St. Vincent, but practically every other country & colony whose stamps are illustrated in older stamp albums. November 2006 - The British Caribbean Philatelic Study Group (based in the USA) will have its annual meeting in St. Vincent from May 19 to 26, 2007. The group will be staying primarily at the Sunset Shores Beach Hotel; special rates are available for members. 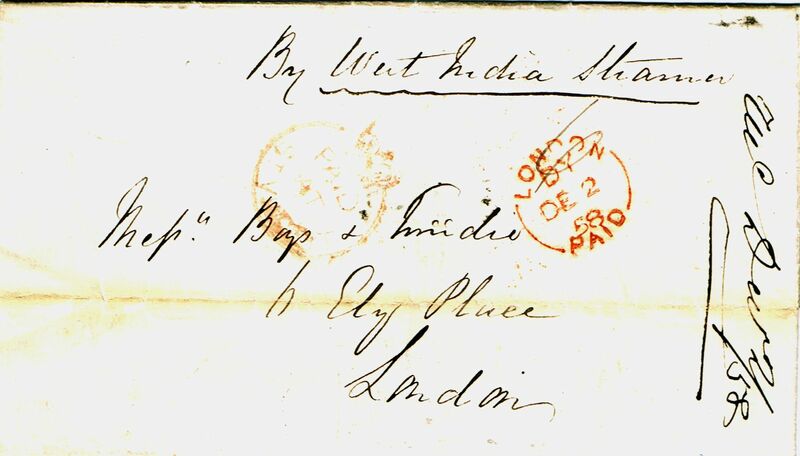 The actual stamp-related meetings will probably be on the 24th - 26th, with the earlier part of the week for exploring the island (which may of course include "philatelic" activities such as visiting the main and village post offices. September 2006 - Starting sometime in 2005, the St. Vincent Postal Corporation issued new "square" postmarks to the various village post offices. Nearby is a postmark from the "Fancy" post office, located in the extreme northern edge of St. Vincent. Other new square postmarks seen by the author are from Byera, Calder, Sandy Bay, Greggs, Lowmans Hill, Rose Bank and Canouan Island on the Grenadines of St. Vincent. Postmarks from some of the other villages from October 2005 still had the older style double and single circle postmarks. The postmarks are actually not quite square, measuring 32 mm wide and 27.5 mm tall. They incorporate the village name followed by "P.O." 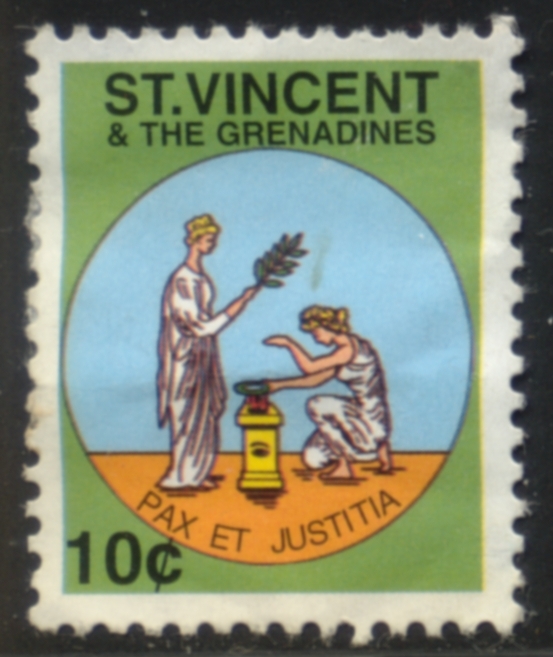 on one line, then the date and "St. Vincent & the Grenadines W.I." on the bottom two lines. The main post office in Kingstown has been seen using a new "large" circular postmark. May 2006 - Another find at the Washington 2006 International Exhibition was this 1858 stampless cover with a "crowned circle" PAID AT ST. VINCENT cancel. May 2006 - I found this stamp, the 10¢ value from 1938-47 at the Washington 2006 International Philatelic Exhibition. The stamp has, what the dealer called a "confetti" flaw; a circular portion in which there is no ink present. It would appear that a circular piece of paper (most likely from a hole punch) managed to get temporarily stuck on either the printing cylinder or the paper. The circle measures exactly 5mm in diameter. It appears to be an unrecorded error. 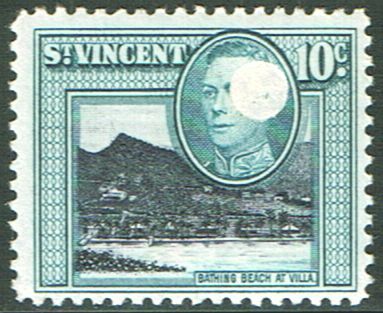 January 2006 - The British Caribbean Philatelic Study Group (based in the USA) will be holding its 2007 Annual Meeting on the island of St. Vincent! 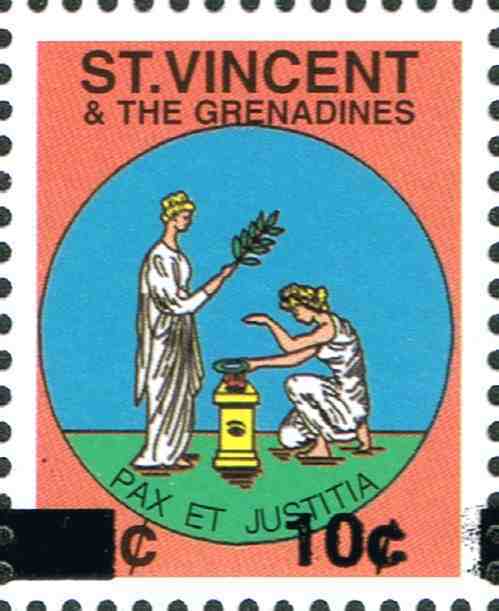 The St. Vincent Postal Corporation will be issuing a special stamp(s) in honor of the group. I'll post further news as details develop. 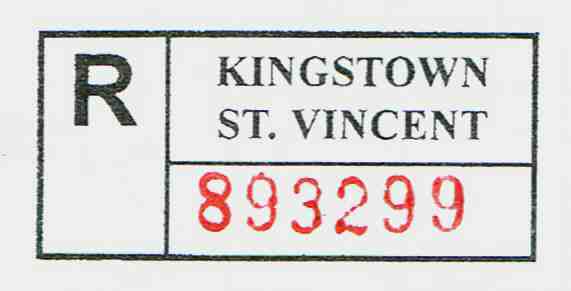 July 5, 2005 - I have just received a new registration label from Kingstown, St. Vincent. While the overall look is the same, the actual registration number is now in red (whereas it used to be in black)! Since all of St. Vincent's 50+ post offices have the capability of sending registered mail, it is unknown at this point whether or not the village post offices will receive these new 2-color labels as well. June 29, 2005 - I have just received the postmark shown in the scan above (cropped from an envelope), dated June 21, 2005. This is the FIRST "square" postmark from St. Vincent. According to a communication I received from the St. Vincent Postal Corporation earlier this year, various village post offices are to receive new postmarking devices. This would appear to be one of them, from "South Rivers" which previously used a very worn single-line circular postmark. 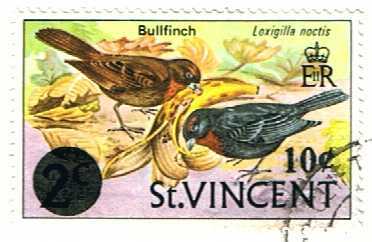 October 26, 2004 - I have just received a previously undocumented stamp with a "10¢" overprint on the 1970 2¢ Bird definitive stamp (illustrated above). The stamp is on a postcard (along with another 50¢ stamp) mailed to Germany from Clifton, Union Island, postmarked on 11. April, 1994. To the best of my knowledge, the postage rate for an airmail postcard to Europe was 60¢ at the time, so the correct postage was applied. 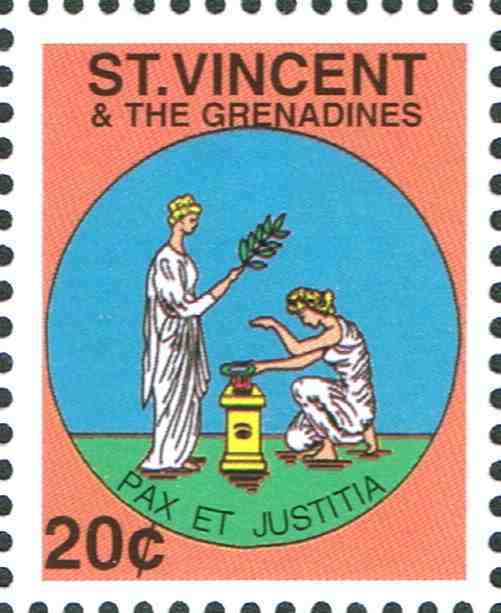 There have been several instances of regular St. Vincent postage stamps being overprinted with 10¢ and 20¢ values by the St. Vincent Revenue department for use as revenue stamps in the 1990's (and in some cases the word REVENUE is part of the overprint as well, but not in this case). What is unusual, is that this stamp was 24 years old by the time it was used. It is unknown at this point when and where the overprint was printed (although most likely in Kingstown sometime in the early 1990's). It is amazing that there were enough of these old stamps still around at the time to warrant overprinting them. It is now 10 years later, and I have not seen or heard any mention of this particular overprint variety! Aside from whether it is a proper postage and/or revenue stamp, it is still another wonderful discovery, considering that it is most likely a revenue stamp used as postage! 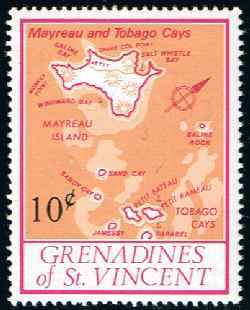 June 17, 2005 update: This stamp and many others have been listed in the 2005 Michel Caribbean Stamp catalog. Scott's Stamp Catalog will also be listing them in the 2005 Volume 5 of the Scott Standard Stamp Catalog to be released in the fall of 2005. August 27, 2004 - I received both of the stamps shown above in the mail (all in full sheets of 100). While I have been aware of the 20¢ revenue stamp on right above (the companion to the 10¢ stamp shown below), apparently they must have run out of the regular 10¢ revenue stamp and started overprinting the 20c stamps with black block on the left and "10¢" on the right. According to Steve Zirinsky, this stamp was overprinted in June 2004 with a quantity of 500,000. The overprint was most likely carried out on St. Vincent; the stamps themselves were printed by "BDT International Security Printing Ltd". The paper is NOT watermarked and the stamps are perforated 13½ on both sides. The gum is of PVA type. While the stamps do not specifically state the words "revenue", that is what their intended use is, and to my knowledge are not valid for paying postage and registration fees. In early November, 2003 I was given the stamp shown above. While it may look like a postage stamp, it is designed for revenue or fiscal usage. 10 cents is a common amount that has to be paid for revenue in St. Vincent. For example, in 1983 I purchased a bottle of beer at a supermarket in St. Vincent and on the back of the receipt they put a 10¢ postage stamp. While postage stamps could be used for revenue purposes, it appears that they have started to issue specific stamps for that task, although they are not always identified as such. The stamp is perforated 13 ½ on all sides and appears to be printed on unwatermarked paper. No further details, such as issue date, are available at this time. A new "Type D Blue" forgery discovered! In early June, 2003 I obtained the forgery shown above at an eBay auction. It most closely resembles the "Type D" forgeries mentioned in the "St. Vincent" book by Pierce-Messenger-Lowe; however, it appears to be even cruder in execution; additionally, this type is only mentioned in "blue-green", not blue. A fake overprint as shown on the stamp to the left. This fake overprint is designed to emulate St. Vincent Scott #31 as shown in the center. The stamp on the right is a previously known forgery, as discussed in the 1971 book "St. Vincent" by Pierce-Messenger-Lowe (page 136). There is NO MENTION, however, about the fake on the left in the book. The "GB 40" postmark is also suspect. 1) the real stamp is "yellow green" NOT "pale yellow green"
3) the real overprint uses a lower-case "d", NOT an upper-case "D"
This item was found on an eBay auction, and shows that there are still "finds" to be made! 1) A previously unknown "Half Penny" forgery of the St. Vincent Half Penny orange issue from 1881 (Scott #24 or Stanley Gibbons #36). The illustration above shows a genuine #24 on the left, with the forgery next to it. "World Forgery Catalogue" by G. Kock. 2) A previously unknown "10c REVENUE" stamp on a St. Vincent $2 Christmas issue from 1981 (Scott #638 or Stanley Gibbons #684). An illustration is shown above to the right.